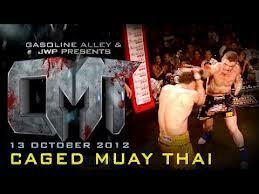 Like it or loathe it, Wayne Parr’s new promotional venture, Caged Muay Thai, is here to stay. Some of the other featured fighters give us their two cents’ worth on the experience. “It was awesome; a different feeling. You’re locked in there, surrounded. It gives the event a different atmosphere. A little bit more adrenalin. “I didn’t train any differently. The biggest difference between normal Muay Thai and the Cage is those little gloves. When your hands are up, they’re not protecting your whole head. Next time, I’d focus more on training defence. More footwork; getting in and out to avoid being hit. “My brother, Michael, fought. It was different preparation, because the cage is bigger; you’re working in a bigger space. We’d do pads and then go into the ring for one or two rounds. That way, you’re always prepared for close-quarters. We also paid attention to footwork and angles for that explosive ten-to-fifteen seconds. There’s lots of punches, and not much kicks, because you don’t want to give any room. You want to be ready for when you get pushed against the cage, to push forward and explode. We stuck to the plan [and won], so I guess it worked! “It was my first fight back in two years. I was able to fight in front of all my mates, which made it extra special. The little gloves adds to the hype. You hit harder – and faster. Parr asked me over Facebook if I was interested. Back in the day I used to fight on Boonchu cup with him and Flip – it made it like old times. I wasn’t really training, just working. Then thinking about it, sent shivers up my spine. I knew I’d regret it if I didn’t do it. I even got a sponsor out of it – Mr Bulldog, who is a lawyer. I’m not working anymore, I’m back to fighting; it’s officially a comeback. This entry was posted on November 9, 2012 at 1:17 pm and is filed under Journalism, Kickboxing with tags Aaron Leigh, Flip Street, Mark Pease, Mark Ritchie, Mer Bulldog, Michael Badato, Reinhardt Badato, Strikeforce. You can follow any responses to this entry through the RSS 2.0 feed. You can leave a response, or trackback from your own site.